The Old Foodie: The Banquet of the Mayors. France expected the world to watch (and it did) on this day in 1900 when it celebrated the new century with a supreme example of “the supreme rite” of civilisation - a banquet. It was nearing the end of the fifth Exposition Universelle, and every mayor of every municipality in France was invited. By any standards it was a monumental production, and the catering firm of Maison Potel et Chabot did the city proud. Almost 30,000 guests sat down at 7 kilometres of tables set up under 35,000 square meters of tents in the Tuileries Gardens, and were fed food prepared in 12 separate kitchens spread over 4 km by an army of 4866 workers, of whom approximately 3,000 were waiters. Communication between catering staff was by a state-of-the-art telephone system, and four (or six) message-carrying cyclists, the whole being supervised via a roving automobile (or was it two?). It was reported that it all went off without a single hitch – apart, that is, from some anti-Semite comments by the Mayor of Algiers, and “the lights and brilliancy of the gay city” proving too much for three other mayors (“worthy peasants, who had probably never before left their native villages) who “went mad”. 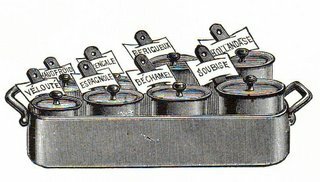 To emphasise the scale of the catering exercise, for those of you who like big number trivia, the banquet required 2,500 litres of mayonnaise, 50,000 bread rolls, 3,500 salt cellars, 700 pots of mustard, 1500 Camemberts, one ton of sugar for the coffee. Filet de boeuf en Bellevue. Pains de canetons de Rouen. Naturally there was wine. As far as I can make out there were carafes of Preignac and Saint-Julien, and (not specified so presumably bottles of) Haut Sauternes, Beaune Margaux Jean Calvet 1887, Champagne Montebello. It is no surprise that the chicken dish specified “Poularde de Bresse”. Bresse chicken is the only poultry in the world to have its own A.O.C designation – granted in 1957 in recognition of its four hundred year old reputation. You can recognise a Bresse chicken by its French-flag colouring: red (comb) white (feathers) and blue (legs), the metal band inscribed with the growers name around one of the legs, and the happy smile on its face because of its open air lifestyle. Here are Auguste Escoffier’s no-frills instructions for Roast Chicken. Truss the chicken, season it inside and out, wrap it in a strip of pork fat and roast it in a moderate oven or preferably on a spit. The average time of cooking for a 3 lb chicken is 1 hour. Gauge the state of the cooking by letting a few drops of gravy from the inside of the chicken fall on a plate. It should be quite colourless. Pour a little of the cooking liquor over it and serve it with the rest of the gravy and some watercress. Thank you for the details on the banquet menu, and the interesting information about the bresse chickens. Hello again Lucy. I have only had Bresse chicken once, in Paris a few years ago. It is fantastic and I cant wait to have it again some time. Thanks for your comment. I have just bought 4 Poullarde de Bresse, and somewhat out of pocket now but in awe of the reputation of these birds I wonder if you have any thoughts on the best way of cooking them?